The proverbial “the kitchen is the heart of the home” is definitely true at our house. It’s basically one big open space connected to our family room and dining room, and it’s where I spend the majority of my time…along with the rest of my family. Because of this, I like having a space set aside as a mini command center, where I can keep my calendar, papers, files, mail, coupons, and all those other things that come along with the busy-ness of life. It’s where kids bring their school papers, my husband drops off receipts, where I open the mail, and make my lists. I do have an office, but it’s far from the kitchen, and I like having it at my fingertips. All the openness is lovely, but with the 11 large windows alone (I’m not complaining about the light…it’s wonderful), it provides no wall space at all for me to hang anything. There are a lot of great ideas out there for command centers, and I know how I would love to do it if I could, but none of those options are available to me. Even the side of my fridge won’t work! Finding something that will work for your space is the key, and I did! So, if you’re in my position, with not a lot of wall space, this might work for you too. So…I designated a small corner on my kitchen counter, right next to a walled off space where I could hang my calendar. 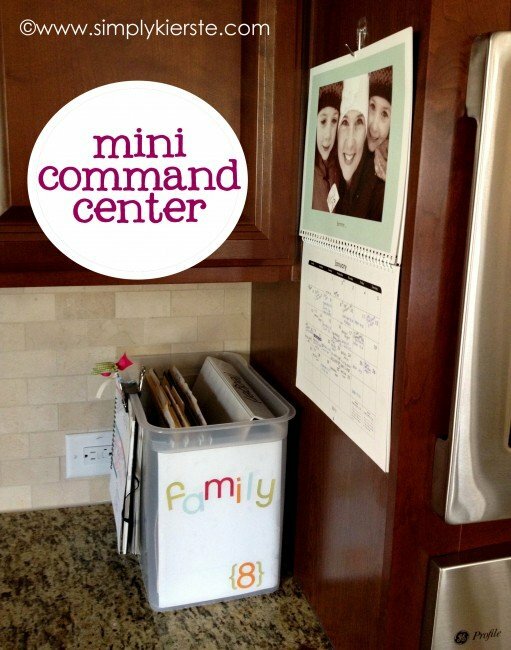 I used a clear file box, hanging folders, file folders, and printed labels to create a space that’s perfect for my own mini command center! YAY!! Organization makes me a HAPPY girl!!! 1. I wanted a file box where I could keep all of my files, and have it be big enough to keep a binder in it as well. I also didn’t want to spend a lot, so I could quite a few criteria I needed to meet. I found the perfect thing…a plain, clear file box for only $5!! It did come with a lid that I wasn’t planning to use, but I always save it in case I needed it for later. I love the size–big enough for everything that I need, but not so big it dominates the space. I was going to cut vinyl for the letters on the side of my file box, but I came across these stickers in my collection, and loved the colors, so I decided to use them instead. I did use a large piece of white vinyl on the inside of the box, so that you couldn’t see the files once they were inside. I just cut it to fit, and stuck it in–easy! 2. I then created labels in Microsoft Word for all the different files I need, printed them, and placed them on the tabs of manila folders. 3. I separated them into three categories: Family, School, Office. I organized the manila folders into one of those three categories, and placed them into one of the three hanging files. 4. 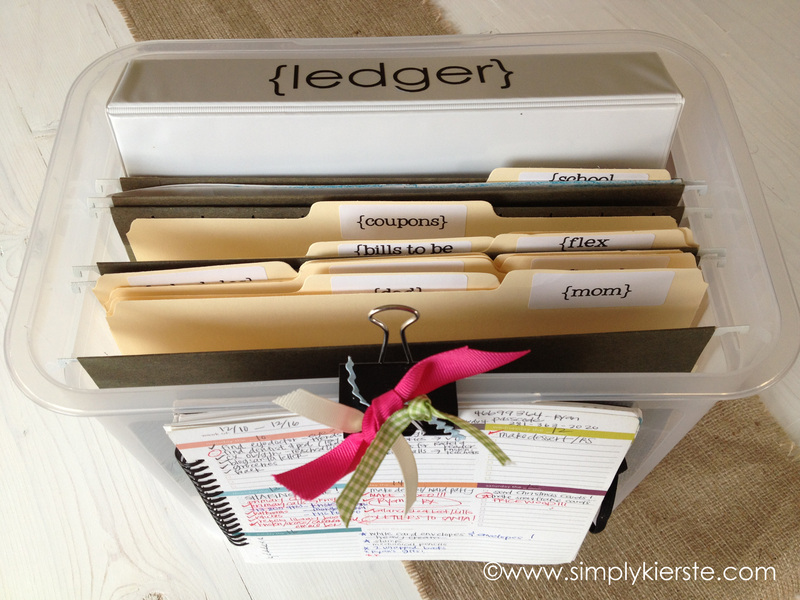 I used a large binder clip that I tied ribbon onto to clip my weekly list book to the front of the file box. I’m a LIST girl, and I’m love with that book! I love planning by the week, and it’s a whole book dedicated to just that. I got it from Paper Coterie last year, and it’s one of my favorite possessions! It’s easy to clip off when I need it, and just as easy to clip it back on to keep it out of the way. 5. My master calendar is hanging right above the file box, so I can immediately write down dates and other information, and use it as a reference as I’m making plans and lists. TIP: Open your mail immediately–shred any junk mail with your name on it, throw away trash, cut out coupons, and file everything else. It will greatly reduce clutter, make your kitchen so much cleaner, and greatly cut down on the chance you’ll lose anything! There are so many options for embellishing your box, and making it fancy as you like! 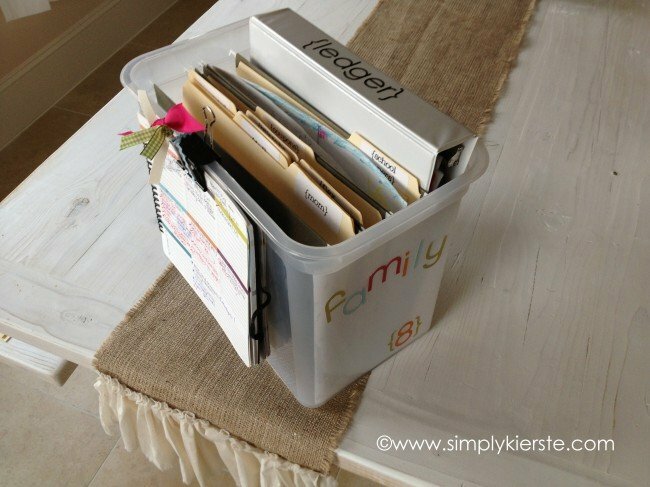 You could mod podge paper or fabric onto it, use different text or graphics with vinyl or stickers, or keep it clear and decorate the hanging files and folders instead, and see them through the box. This really is an easy project that doesn’t take long to put together, but will save you SO much time and energy. I made mine for $5 (I had all the other supplies), and so it also doesn’t have to be expensive. Organizing doesn’t have to take a lot of money, but it’s definitely worth the effort. I love those file boxes. I have one for each of my children for their school work and report cards. Me too, Katrine! I love them for school boxes too! I love this idea! It is easy, inexpensive and just perfect. Thanks for sharing. Such a great idea! What kinds of things do you keep in your ledger notebook? Instead of a small checkbook register, I keep track of it in the ledger. It’s also a place for our budget, receipts, etc. I do all the finances at our house, but it makes it accessible for both of us! 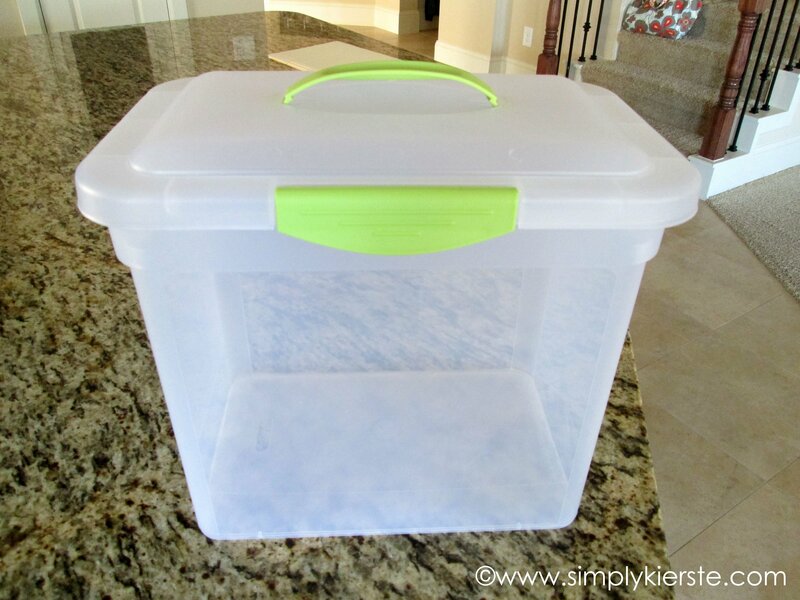 What are the dimensions of that clear box you got at WM? It looks perfect! I want to go looking for it… any help would be great on where to find it! Sure, Claudia! I got it at Walmart, but not in the office supply section. It was with the other rubbermaid and storage containers. It’s 12 inches on the front and back, 11 inches tall, and 7.5 inches on the sides. Remember, it comes with the lid, so look for that too. Good luck!!! Would love to know where you get your font from. SO cute!! I got my table runner from any etsy shop–TheShabbyCreekShop. I LOVE it! She had it in her shop in the wrong size, but a custom order was super easy! And would you mind sharing where you got your table runner? Precious! I would like yo know more about your list book…i always make a list however I am always losing them. I have one of the weekly planners from Paper Coterie. You can find it here: http://www.papercoterie.com/product/planners/. You can preview it there, to see if you would like it. I love it–plenty of space for lists, and there are enough pages in there for at least a year. It fits in my purse, or can stay on my kitchen counter or next to my bed. I like being able to refer to past lists the month or even two before–notes that I’ve jotted down, etc. Check it out!!! Thank you for sharing – great idea! I love your table by the way and did you make the burlap table runner? Thank you, Karie! My table is one of my favorite things. :) I didn’t make the table runner–I got it on etsy, from a shop called The Shabby Creek Shop. She’s awesome!!!! You are amazing. Thank you for sharing your command center. I have the same issue. Yay, I am excited you are planning a post. Would you mind telling me what your folders are like that hold your receipts? Congratulations. on your new bundle. I hope all goes well for your delivery and you make a quick recovery. Do you ever post about your ledger? I can not find a post and would love to see it!! I didn’t ever post about it, but you’re not the first one to ask. I’ll put it on my list! :) If you have any questions, I’d be happy to answer them now! Can you still purchase on the Paper Coterie website? I can’t find it and your link won’t bring me to it. I love your planner and am wondering what you are using now if you can no longer purchase from Paper Coterie? I qas just wondering if you have made a post of your ledger? I would really love to read about it. I have had so many requests about this, that I’m going to be posting about it in the next few weeks, so stay tuned!! Great tips! What size planner works best for you? I like a smaller planner–one that will fit easily in my purse, because I like to be able to take it with me, and have it on the counter when I need it! I have a larger desk calendar that stays home. The one I’m using now is about 6 inches high, and 8 or 9 inches across. It’s by Sugar Paper, and I love it! You can find their calendars at Target, or on Amazon! I love this command center. Where can I find those bins? I looked today when I went to the store, but the ones I found was too big. I got them at Walmart. They can be tricky to find–look in both the office supply section, and in the rubbermaid/tote section. I’ve also found them at Target, and office supply stores. Good luck! I’ll keep an eye out too.